Feedback from our family collected from 2006 to…now! These are private letters and unsolicited reviews about our malas beads and service collected prior to our Product Reviews that can be found on each item’s page. Comments are all from Verified Purchases and Customers. Hi, I received my tiger’s eye mala yesterday. I love, love , love it. It is the perfect weight, size and I know it will help me to become consistent again in my practice. Thank you so much for a beautiful mala. Just received the mala bracelets I ordered and I’m really totally impressed with the quality. Especially for the price. Ordered 4 for a variety of reasons and can’t wait to add to my practice. Will definitely be ordering from this site again, highly recommend. Your quality is wonderful and I thank you for that! Thank you so much! I bought these three: 8mm Onyx & White Jade Mala Mini Mala- White Jade Necklace Freshwater Pearl Mala They are truly GORGEOUS!!! They are genuine and just so beautiful! They are made very well! I really have no complaints at all about these. They are even more beautiful in person. I will only buy from here now on! They arrived great time and packaged well. The bags are pretty and good quality. Well worth EVERY penny! I have my wishlist started of all the ones I will buy in time! I feel the power of these and I am so thankful! Thank you for the amazing work on these and for having this store! Buy from here, you truly will not regret it!!! I just received The Bliss Mala and it is beautiful! The stones are in shades of light pink, pink and pinkish-grey. I am sure to get plenty of compliments. Thanks you so much for an amazing mala. I received exactly what I ordered. My beads have been with me for several months now and my Mala was well crafted. They shipped the product quickly. I will be ordering again in the near future and consider Sakura Designs my go to for all future purchases. Just received my 108-bead mala in the mail, and it is more than I had hoped for. The color is spectacular, the beads have a great feel, and the entire mala has a beautiful energy to it. I can tell it was made with good intentions, and that is what truly makes or breaks a product. So glad I found your site! Thank you for making such a lovely product! I was pretty excited when I ordered this mala, but I have to say, it’s absolutely beautiful. Definitely the nicest mala I have ever owned. The construction is high quality and solid, and the adornments and extra touches are really great. Worth every penny. I have purchased several malas from you at Sakura Designs and have been extremely happy with all of them. I want to take a few moments to share my experiences with the Boddhi Seed with Turquoise mala that I purchased. I have studied that it takes approximately 40 days for a mala to be thoroughly “seeded” with whatever mantra we chant into it; however, as soon as we begin chanting, the mantra energy starts to flow. As soon as I beheld my Boddhi Seed with Turquoise mala, I felt a sense of great peace and joy. When I started chanting, I seemed to be completely relaxed and balanced. I feel that whoever strings a mala places his or her energy into it initially, and thus, I feel that you at Sakura Designs are very sincere and loving people who are serious about your spirituality, and it envelops the malas that you create. Your malas arrive with comforting and healing energy already implanted within them. We are blessed to own malas from you. Namaste! All I have to say is WOW! I purchased my first mala from Buddhistmala.com and I had no idea what to expect. I received it in the mail just a few short days after purchasing and I have to say that I am more than pleased. It is exactly what I was hoping for and more. The mala is real sandalwood and the scent is very powerful in a good way. It has a soothing and calming effect that can not be explained. After reading reviews about sandalwood malas I learned that most are just scented with oil and sold as real pure sandalwood. I can say that this mala is legit. The construction is superb and better than expected, the beads are all “matching” and the free mala bag is great. I was surprised to find a little booklet about malas and mantras. The price of the mala is very affordable and I can’t believe that this is what I received. I am going to purchase another mala from Buddhistmala.com for sure. I purchased the Pure Sandalwood Mala Prayer Beads (SKU: MA-65) and everything about them made me a loyal customer. To all at Buddhistmala.com,thank you so much for everything and you will hear from me again. With much happiness and love, Ken. Namaste. Namaste! I just received my latest mala from you–the Redwood and Dzi Beads–and I just had to let you know that it is absolutely fabulous! As soon as I opened the package, I was astounded by the gorgeous wooden box which housed my sacred mala as well as the beautiful pouch. This “one-of-a-kind” mala is definitely befitting of its name. It felt calming, healing, protective and peaceful as soon as I touched it. I have purchased several malas from you in the past, and I will continue to do so. I appreciate the quality and the quick delivery. May you be blessed at Sakura Designs for all that you continue to do to help to elevate the consciousness of our world. Aum Sat Tat! Thank You. The two malas I ordered for my wife and myself arrived very timely. When we opened the packaging we were stunned by the beauty and craftsmanship. This is my first Buddhist Mala. Well done. You have my business for life. If you are reading this review do not hesitate. You will not be disappointed. First, let me start by stating that normally I am not one to write reviews no matter how amazing the product is, however, I had to write one this time. I received my Mala a few days ago and was shocked at the craftsmanship. This Mala is STUNNING! I bought 2 other Malas – Lapis Mala (Reconstructed) & Onyx & Mother of Pearl Mala – which are just as beautiful. I stared at them in awe for a good 20 minutes before I could put them down. I am new to the Buddhist practice but I am happy I will be able to start off right with these beautiful Malas. I cannot Thank You enough. I will be back to buy more not only for myself but as gifts as well. review about what is expected. However, when I received my mala from you today, I was firstly delighted by the speedy delivery! Then, when I opened the box the mala was so gorgeous it took my breath away and stilled my mind. I could never have anticipated such beauty. Rainbows that glisten from every bead … the feeling of dazzling light energy … WOW! I just could not stop staring at it … it is mesmerizing! I wanted to thank you and my husband said “write a review to thank them” … so here I am, expressing my deepest gratitude and appreciation for the skill that went into making this mala and I can feel it was made with great love and care because this mala feels sacred. Thank you! Dear Sakura Staff, I have received my order of the Sandalwood Mala with the snake knot last week and I most say that I am extremely satisfied with you service, speed, and product quality. You guys have earned by business long-term. I do have one complaint though: I really wished you could make a bracelet mala form with sandalwood. I promise to be your first buyer if you guys ever come out with that. Truly though, thank you so much. May you reap great merit for your work. Dear Sakura Design, Thank you very much indeed for the beautifully made quartz crystal mala which arrived today. The beads are evenly calibrated and not strung too tightly – just right. Also, your presentation with the box, silk pouch, and mala manual was lovely. I will happily be using this mala for a long time! Recently, I ordered the Tigers Eye Mala Prayer Beads (Item #MA-80). I was very surprised that the beads looked just as beautiful as they did on the company’s website. I am very satisfied with the quality of the beads and the free mala bag that came along with it. I would recommend Sakura Designs to my friends. I have been a customer of Sakura Designs for just over 5 years now. Everything I have received from already made malas, to imported malas, to custom malas have been nothing short of perfection. In fact I am waiting on my now 4th custom mala and I already know it too will be perfect. The service provided by Sakura Designs is bar none. Fast shipping, and even faster responses to questions. The materials used are beautiful and well made on every mala. I have learned to make my own prayer beads now but I still come back to Sakura Designs time and time again (cant even come close to doing a snake knot like they have perfected) Even if you are not a Buddhist and you are looking for some universal meditation or prayer beads I urge you to try Sakura Designs. (12/24) – a timely arrival, as I will be away on a trip beginning Monday, 12/26. I am very happy with the design of the set, the beautiful bag, and the whole manner of presentation. Best wishes for this holiday season. I got my Tibetan Rosewood Mala today and once again, Sakura Designs has come through with another great product. The design is beautiful as is the quality of the product. I am once again very happy with my mala and the timely delivery. Thank you Sakura Designs! I will be ordering again soon. Metta! Procured the wrist and 108 Tiger Eye Mala about a year ago and absolutely love both of them. Gifted my Budo teacher a 108 wood mala as well. Best design on the net. After researching many sites for Malas ( and trying to make my own ) , I finally decided to order from buddhistmala.com .We are in total love ! I was able to find EXACTLY what my Husband wanted – 108 in Hematite & Tigers eye , for me The Bliss Mala – 108 Lepidolite & Jade , it is perfection ; both products were exactly as pictured on the website. The shipping was only a few days , quite faster than I expected . We will definitely order again from here ! I wanted to let you know that I have received the lapis mala with a snake knot yesterday and it is simply exquisite. I have not seen another that shows the same quality and care in choice of materials and workmanship. Such a delicate and regal item is really more than what should be in these hands for practice. I thank you for your work and time. I received my mala and counters today and am very pleased at the quality and craftmanship! The Tiger Eye mala is beautiful and is everything I hoped it would be and more. Very high quality ! The counters I ordered for it are great as well. 100 percent fully satisfied with my purchase and delivery time. I will be shopping here again and tell all my friends to do the same. You guys are AWESOME! I am also very happy about the quick responses I got back from questions I sent. I cannot say enough good things about Sakura Designs. Great prices, great products. You have a customer for life! Thank you very much! I received my Sandalwood Mala and love the look and aroma of it as I assumed I would. I also ordered a Bodhi seed wrist bracelet just out of curiosity and I love it. Took a few days of getting used to the unusual smell of the bodhi seeds and a while to get used to it and now bodhi seed malas are my favorite [ I ordered a praying bodhi mala from you today]. I especially love the larger beads [seeds] and the feel and texture in my hand. I also like the elasticity of the bracelet. I find myself wearing it and taking it off frequently just to feel and contemplate. A well-made durable product. I just received my gorgeous “Pure Sandalwood” mala after just having ordered it this week, and it is absolutely lovely! As your on-line information says, it is a “true treasure”. I will definitely be ordering more malas from you. You are the best company that I have researched. You are a blessing to our planet at this time May everyone at “Sakura” be continually healthy, happy and prosperous. Order #7689 – received yesterday and even better than expected. LOVE your product, site, price, timeliness. THANKS. I was astounded to arrive home to find my mala had arrived in Australia only 5 days after ordering it. I ordered the Swarovski crystal mala and it really is truly magnificent. Never have I seen such a beautiful mala and I can assure you I have seen just about everyone available at Boudha. I am so looking forward to having it blessed by my teacher and using it for my retreat. I received my red coral abacus mala today and I am so pleased. It is beautifully made and looks like a piece of jewelry. I am grateful that I had the opportunity to own something as beautiful. I ordered several items from Sakura designs before and I have never been disappointed. They have the best Dharma items for your Buddhist practice. This company is awesome!! They are so kind and they dont seem stressed, as most companies do, May they live and prosper in peace…. Thank you for the two strands of gemstone and bodhi malas that I recently purchased from your site. They were perfectly beaded as ordered and shipped so quickly! I just received my red tiger eye mala and just wanted you to know that I am SO pleased with it. The bag alone is absolutely gorgeous (and a nice size so you don’t have to cram the beads into it like others I’ve had)…. but the BEADS, the MALA – WONDERFUL. It is exactly what I was hoping for; the vibration and energy of the stones is so high; and my chanting practice will step up to a new level with this! THANK YOU for your beautiful work. It is obvious that you “sentient beings” who make these malas are living the Dharma. N’amaste. “ I would like like to congratulate Sakura Designs on terms of a high quality product at a fair price. I was very satisfied with the Kyoto Lapis Lazuli 108 bead mala which I received in a very timely manner only three days after I had placed the order online. The product I inspected was of higher quality workmanship than I had expected and it is very sturdy. A true heirloom piece, It will be handed down from generation to generation in my family and your company can certainly expect further business from me and others I recommend it to. Thank you for your time and effort. I received the above order today. I am more than pleased with my purchases and the prompt service you provide. I am sure I will use this service again! I would like to thank you for the expedient service I received. My order was exactly as described on your website, excellent quality and was delivered quickly… within 3 days. This kind of customer service is becoming rare these days. It is appreciated and I will continue to order from your website with confidence and pleasure. The mammoth bone mala took me by surprise. There is such an exquisite elegance to it that it really touched my heart and brought a tear to my eye. I want to thank you for the lovely red and pink silk bag. I had asked for a brown bag but this is beyond what I was looking for and I am very pleased to have it. Thank you for your kindness in dealing with me. I appreciate it. Received them today, they are stunning, i’ve ordered two more. thank you and happy new year! Your beautiful fancy Jasper Mala ( order 4443) just arrived. Dear Buddhist Mala personnel, I had recently purchased your Tibetan Coral & Turquoise Mala and were pleasantly surprised with the quality of your mala. Just received my shipment of lapis lazuli, sandalwood and cedarwood malas. They are so beautiful. Thanks for the quick and hassle free service, I’ll pass your details onto my friends at the meditation centre. The quality of the Tiger Eye Mala is superb! Also purchased the Amethyst Mala and it also is of excellent quality. I’ve been wanting a mala for a long time but they are very expensive at our local shop. The prices here are by far the best for the quality! Shipping was very quick too. These are, by far, the most beautiful malas I have ever found. The “hand-feel” (for doing japa practice) is extraordinary, the stones are lovely and the workmanship is of a very high quality. They are made to last a long time. This is the first time that the actual object exceeds the photograph, in my experience. The Bodhi seed mala that I have received is the most beautiful mala I have ever seen. The texture is absolutely exquisite. The colors of the dark bodhi wood, bright red coral, and the light blue turquoise blend in harmoniously! I highly recommend on purchasing this mala. Thank you! and for the beautiful reminder from the Dalai Lama! I just wanted to tell you how incredibly happy I am with the wrist malas that arrived this week. I have tried many different places for high quality wrist malas, but yours are definitely a step above the rest. (I was actually so frustrated with the poor quality of others that I stopped wearing them.) I’m so glad to have found you! You’all have done an incredible job, it is wonderful…can you custom make me counters out of small Lapis and Silver, perhaps next month? Just received my Mala, thanx this was fast and it’s beautiful!! We received the malas and dzi bracelets and are truly appreciative of your care in design and respect in presentation. The bone mala is perfect and I love the three beads you chose to balance the guru bead. We will certainly be availing ourselves of your services again. Thank you for providing these precious items. I love my 108 bead 8mm baltic amber Mala so much that I ordered the matching honey colored wrist Mala just days later! Both are now complimented with a beautiful hand carved Guru bead. The 108 is very simply knotted with the two strands coming down from the finishing knot under the Guru but both strands are adorned with three little 7mm amber beads per strand. So it’s very simple but very beautiful. Every time I open the pouch, for either Mala, you can smell the beautiful faint aroma of pine that’s associated with natural amber incense. Anyone familiar to real amber knows the smell and you can tell it’s genuine amber… and beautiful to boot! To have it on my person brings a feeling of warmth and happiness that further proves the power and authenticity of these amber prayer beads, & meditation with these beads is beyond words for me. I bought the Tibetan rosewood and turquoise as my first Mala and, since it was already a pretty low price plus it was on sale, I was simply hopeful that the energy would feel right in them. I received them two days after USPS e-mailed me confirming that they would be receiving a package from this site. Not only do they feel right, they are beautiful! I’m very pleased with this product and I will recommend this site to others. Thank you for making these items available. You are assisting the world with your products! I just LOVE my Tibetan Red Coral and Turquoise mala for my Vajrayogini Highest Yoga Tantric practice! I am very impressed with the high quality and craftsmanship of your malas! I am also very impressed at your beautiful website. You are a Bodhisattva! You are helping all sentient beings and especially Buddhist practitioners with your work. Thank You!!! The mala I chose….a stained lotus seed mala….is beautiful….robust, delicate, and sacred all at once. Thank you Sakura Designs for offering such finely crafted merchandise….and thanks, too, to the craftspeople who assembled the mala. I cannot express how much I love the mala I purchased from buddhistmala.com. Where do I start?? It is exactly what I wanted and even better than described. I had been looking for a genuine sandalwood mala for a few weeks. At first I thought, I’m going with the cheapest option available: Ebay. After contacting several sellers, I realized that what I was going to get was some cheap beaded necklace with NO scent… I really wanted a quality mala with a natural scent..and I wasn’t going to get it by reaching for the cheapest options on the net. So as I googled away looking for other purchasing alternatives I stumbled upon buddhistmala.com. First of all after searching literally more websites than I can count, this is the first one I came across with such a vast array of choices. And the pictures and measurements gave an REALLY great description of what one can purchase. At first I thought, hmmm this IS a bit more than I wanted to spend but reading the descriptions for items it was clear that you were getting what you pay for….quality. The website also informed me that those $10 sandalwood malas I had looked at on other various websites where probably cheap and soaked in sandalwood oil…meaning that it would probably fall apart relatively soon and that it would probably have a lovely scent….for about a week…then nothing. I read this and was like What?! I wanted to get it for cheap but I also expected a quality product. So after a day of pondering I decided, hey why not spend a little more if it’s going to be worth it. So I get my mala in the mail and seriously I am in love. Firstly, you can tell by looking at it that it is extremely well made. Mine is pure sandalwood with three beautiful red jasper beads. And second, the smell!!! It’s heavenly. Not overwhelming, not annoyingly subtle. Purfect potency of scent. To top it off it came with a very lovely mala bag…not that I am ever taking this off lol. Anyway, really I cannot sing the praises of my purchase from buddhistmala.com enough. I buy a lot of stuff online and I don’t ever write reviews for anything….but in this case I made an exception. Very satisfied with my purchase! I just got my order from Buddhist Mala and am in LOVE with the quality of the beads and the bags. I am sooo happy I got these today – I was stressed at work. Perfect timing. I will pass you along to all who wander my way. Thank you and have a GREAT day all. This is my second mala purchase from Sakura and I am very satisfied with the malas that I received. I got the red Bone Mala from the Tibet Collection today. It is so beautiful and I love it. It is as finely made as the Green Jade Mala that I had ordered before it. I am also happy to know that it was made by Tibetan Nuns and buying it helps their community in some way. It will be a good friend to me as I use it in my prayers. I ordered two malas from your store, a 108-bead bone mala and a 27-bead rosewood mala. Both are beautiful. They are excellent products, and I am very excited to use them and incorporate them into my meditations. I received my Jade mala today. It is beautifully made and I love it! The bag that came with it is very nice too. I’d been looking for a Jade mala for a long time and the first time I saw this mala in the internet, I knew that it is the one. I’m also glad to know that it is made with love and prayers by people who knows the Dharma teachings. I know that I will treasure it and use it often in prayers. I just wanted to write and say that my package arrived today, I was surprised at how fast it got all the way here. thank you so much for all of your help, and everything is very beautiful. I appreciate the magazine and the extra pack of cord as well, I wont be able to find anything close to either of those out here. also thank you for the mala bag, the tassles and the box. I wasn’t expecting so much, and the surprise was a welcome one. several hours of meticulous toil and i am finished, the snakeknot proved more difficult then i imagined, but the finished product is pretty good. thank you so much. I have placed three orders and I am getting ready for the forth. The quality of the products I have ordered are absolutely outstanding. I have ordered several bracelets for me and my husband. I have received so many compliments on them and have been asked what they mean. I love that you also include on your site an explanation of the item. I continue to purchase items for myself, as well as giving gifts to other people. Thank you for your quick shipping and magnificent craftsmanship. I’m about to make my 4th purchase from Sakura, and every time I”ve been very pleased with the items & service I’ve received. Even when a mix-up occurred with an item I received, the situation was rectified quickly & painlessly! I often get compliments on my Aventurine mala, particularly the high-quality tassel, and seamless transition between the nylon cord & the tassel (in other words, you can’t see where the nylon ties the tassel on). 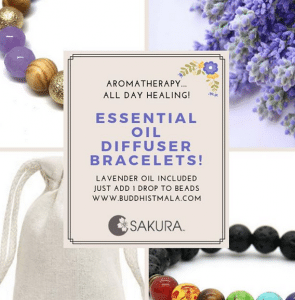 Its hard to know if a site is going to be reliable sometimes, because there are so many out there, but I’m always happy to recommend Sakura to folks at my dharma center when they ask where a good-quality mala can be found! Thank you so much for getting back to me. Good to know for future that they don’t offer (international) tracking. As is Murphy’s law the package arrived today. It is fabulous and I look forward to doing business with you in the very near future. my new mala arrived in the mail today and I know why I’m glad to have gotten from your company. It’s exactly as I had imagined it, simple yet substantial when held in the hand. It will become an important part of my practice and in a few years will become an old friend. I will be sure to let people at the Monastery know who made my mala and where it came from. Hello. I emailing to tell you that I received my beads today, and they are beautiful. Thank you so much for your time and I’m happy that everything has worked out. I’m glad to know that you care about your customers. Thank you again. Best Wishes. I would like to know if you ship to the UK and what your charges are for this. You would like to take this opportunity to tell you that your site is overall easy to use and you show some of the most beautiful malas I’ve seen available to buy online. I received today Hematite, Carnelian and Turquoise Malas that I ordered less than a week ago. I am impressed with the beauty weight and uniform size of the beads on each. Thank you for the excellent pieces and the speed with which they were sent out. I purchased a Desert Jasper Mala and Azurite Mala Prayer Beads. Both items are beautiful and the quality exceeded my expectations. I had called customer service twice with questions and received absolutely excellent customer service. I highly recommend the product and the integrity of the employees of this company. I will be a return customer. Thank you from a very satisfied customer. Thank you very much for the magnificent tiger eye hand mala. It arrived today much earlier than expected and is beautiful. Thank you for the gift box and the pouch as well. This is my second order from you. My first was a full traditional Tibetan boddhi seed mala and it has become part of me and my daily practice. Your products are wonderful and very special. Thank you for this very worthy work. Received my amethyst mala today. It is absolutely beautiful and the workmanship is impeccable! I will be back! Hi- I just wanted to send a quick message to thank you for the Mala I ordered. Tears came to my eyes when I first saw and held it. The craftsmanship is beautiful and is something I will definitely cherish for years to come. Many many thanks! I love this mala! It’s lightweight, wraps around my wrist 4 times just right, and the seeds have special spiritual significance to me. It’s perfect for me, I thank you so much for creating it! Hi, I just received the rosewood mala a week or so ago which I ordered (I always seem to give mine away to people who look as though they need them…), and it is truly one of the most beautiful I have ever seen–or worn. The beads and construction are truly extraordinary, and more than that, it feels truly good to wear, which as you warmly know, is everything. My two malas were delivered within a few days of the order and the quality of the malas were superb. I am extremely happy and am finding my meditation practices already enhanced by them. Dawn could not have been more patient and helpful. Thank you. Just wanted you to know I adjusted to heavier weight and I love my mala. I just wanted to let you know how pleased I was with the 3 malas I ordered. Both the custom and “standard” malas were lovely, as were the pouches provided. They were Christmas gifts, all very well-received by the recipients. The turquoise and jasper mala is beautiful, and even though I bought it for myself, it felt like a gift because it was so nicely presented in the silk bag and the box. Also, thank you for mentioning a community here. I tend to do things by myself, reading books, and meditating alone. Your comment has encouraged me to seek out a community of other quiet thoughtful people, a seeming paradox, but worth pursuing. Just wanted to let you know that I received the black onyx mala beads today and they are beautiful!….And very nicely packaged! (I love your little silver sticker on the box!) Very prompt service/delivery! I just know I will get many years of use from these quality beads! I will definitely be ordering from you again and will recommend you to others as well! I just opened my mala beads and I am in love! I hadn’t quite known what to expect but I almost cried when I touched them-I’ve wanted a strand for years and never really felt it was time to invest in them. I have found that I am ready to devote my energy and intentions to this sacred mind set and I am delighted to have found Sakura Designs to create my ideal mala beads, just the way I wanted them, individual and very special. Thank You! Hi there, I purchased a Tiger Eye mala from you folks a couple weeks ago and really love it! Kelly did a great job! I am wanting to make a hand mala of my own, but am having great difficulty tracking down a Guru bead. Is there any chance you folks would be able to sell/ship me a couple in Black Onyx? Hi Dawn I received your beautiful mala this morning. They will be treasured. I will pass on all enquiries to you. For your kindness, I will make a donation to Greenpeace on your behalf. Again, many thanks and blessings for the future. I just wanted to thank you sooooo much! I got my gemstone mala today & was completely thrilled & amazed by it. It blew away my expectations! You have wonderful craftsman working for you & was thrilled by the bag included! I am so excited & this came at the exact right time! Thank you so much! I’m so glad I found you! I received the malas on Saturday and, once again, they are beautiful! Several of them are for students of mine who are graduating from high school next week despite great obstacles. They thank you very much for such beautiful work and want you to know they will always treasure these malas. I will certainly be back for more in the future. Thank you for your wonderful service. I have received my malas today and they were wonderful and flawless! Love them! Thank you once again. I woke up this morning knowing it was a special day. In the midst of a snow storm my 4 year old son (on march 12) and I trudge to his day care laughing our butts off at the amount of snow that was coming down. It couldn’t have been more perfect, at least that is what I thought. I decided to check my mail and to my surprise, the beads had arrived already. With great anticipation, I opened the package and low and behold the most perfect Mala I have ever seen. Job well done!!! I love the site!! Great service fast shipper and my new malas are amazing!! So much so I’ve placed another order and plan on placing many future orders. I received my standard Rock Crystal Quartz mala a few days ago. It was made promptly after the order was received. The materials used in it are excellent and the workmanship is impeccable. If I decide to purchase another mala or need to restring an existing mala, Sakura Designs will be my first choice. I just got my Lapis mala beads in the mail today and I was SO glad I sat down before I opened the box! It was stunning! The beads are absolutely beautiful, actually much better quality than I imagined they would be. I got a bit weepy-eyed….really. Beautiful. The shipping was fast and the mala is beautiful. Thank you so much!! I just received my sandalwood mala and it’s lovely. It smells wonderful, feels wonderful in my hands and I hope to spend many happy hours with it. Thank you so much! I received my mala today earlier than I had expected (a custom order: Tiger’s Eye with Lapis markers) and I simply had to write to thank you and tell you how pleased I am. It is absolutely beautiful and really glows with a high level of workmanship and gem quality. I look forward to using it in my practice, and will certainly be using you again and recommending you to my friends here in England. Thanks again and I wish you all the best for the future. I received my Sandalwood Mala today in the mail. It’s beautiful. With the scent from the sandalwood beads, the beauty of the blue Lapis Lazuli marker beads, and the blue tassel, it is the perfect mala for me. I started using it right away. Do you have this pattern and style in a wrist mala? I received the turquoise mala. The turquoise is perfect! It is exactly what I wanted. I think the garnet spacers and tassel would have been richer looking even without the garnet guru bead, but I am pleased with this mala. I know this was a challenge for us, but I feel that everything is well, the mala “feels” good even despite the challenges. You do wonderful work and have been good to work with. Best to you, your business and your family. Thank you for working with me on this. The turquoise was important to me. You made that happen. I did look for other sources for more than a year, but all roads led back to you. I am sorry for the discomfort we experienced, but hope that you are as pleased as I that all is well. Thank you. I want to thank you for the sponge coral mala. I received it today. It is truly the most beautiful mala I have seen so far. Just wonderful. Hope to have it as my companion on the spiritual journey for a long time. The mala is absolutely beautiful and smells WONDERFUL. I will be purchasing the sandalwood mala for my father in the future because he is a very devout Buddhist that practices both Pure Land and Chan (Zen) Buddhism. I wanted to thank you for taking the time to speak with me this past Saturday regarding the selection of malas as well as making them the very next day. In particular, I wanted to let you know that I’m very pleased with the tiger’s eye hand mala that you strung on nylon line. I’m glad you thought of suggesting the addition of the two crystal beads. The tiger’s eye beads are quite interesting in that there is considerable variability between beads, whether this is by luck or design, I don’t know, but I think that in combination with the crystal beads, it really adds to the appearance and unique quality of this special mala. Thank you for your bodhisattva work! I bought the Mala for my husband for his birthday and he absolutely loves it! My husband works at a very stressful job and he wears his mala everyday to help deal with the stress. A customized version, with light jade spacers and pale green tassel, was made exactly as requested. Good communication and timely delivery. Thanks for an exceptionally lovely mala! Ordered custom version with lapis spacers and blue tassel. Mala was made to my specifications, and looks beautiful. The goldstone beads are a brown color with magical galaxies of stardust running through them. Very inspirational! Thanks so much. Thank YOU! BTW, this is the 2nd mala that I have ordered from you. (I already have one of your beautiful lapis malas.) You have truly exquisite malas. Thank you for adding such beauty to the physical and spiritual worlds. Good morning. The mala arrived this morning. It’s so very beautiful. Just wanted you to know that I received my mala in the mail today and am very happy. It is wonderfully fragrant and beautifully made with obvious lovingly care. Thank you. Thanks again and I wish you all the best in the year ahead. It arrived – thank you for expediting my order. I recently ordered 3 malas from you. I received them this week. I just wanted to let you know that the quality of your malas (both the stones themselves and the workmanship) are far superior to any I have bought in India, ordered from special “mala sites” or bought at ashrams here in the US. They are truly beautiful and wonderful for doing japa. I just wanted to take a moment to let you know how absolutely thrilled I am with my new mala. Just to give some history, I bought a mala a couple of years ago when I began practicing. The problem was that it had 107 beads. I dealt with it for a couple of years and then decided to get a new one (yak bone) from a company that said they give a portion of the profits to the Tibetan refugees. As soon as the mala arrived I noticed the beads where half the size they should have been. It also broke as I was taking it out of the bad as they had strung it with cotton thread and not very good cotton thread at that. Finally I decided to spend a the extra money and purchase a higher quality mala. After several months I saved up enough and started researching companies. Your company was at the top of my list. I went a head and purchased the Bodhi Seed and Stone Mala (Lapis and Silver). I just received it today and it is amazing. I am very pleased. Finally, I have a decent mala to use in my practice. I am very happy. Thank you very much for producing such a wonderful product. I am stunned by the craftsmanship and quality of my jade hand mala and lapis mala. I am using them in my daily practices with gratitude. I did not expect them to feel quite as wonderful as they do. Thank you for taking the time to make them. I can sense the sincerity given. I also did not expect them to arrive in such a short period of time. Thank you for your diligence. Hello, I just received the sandalwood prayer beads I ordered from you. I cannot tell you how pleased I am – they are absolutely beautiful and smell fantastic. The bag was an unexpected bonus, as was the beautiful packaging. Thank you !! My mala cannot compare with the photos on the website, and all of the examples of craftsmanship are amazing. I ordered a tiger’s eye mala with carnelian counters and a bead knot with knots between the beads. It is exquisite and stunning. I just had to thank you guys for the work. Also, the mala arrived very quickly, less than a week from when I ordered it. I would refer anyone to Buddhist Mala and I will certainly buy future malas from here. Thanks again. Hi just to say the jasper mala was more wonderful then i can say. Your temp staff made good choice better then me thank you.